The main difference between B cell receptor and antibody is that the B cell receptor is a transmembrane receptor of the B cells whereas the antibody is a protein molecule that the B cells produce. Furthermore, B cell receptor has a specific antigen binding site, which can bind to an antigen while B cells produce antibodies specifically for the neutralization of a particular pathogen. B cell receptor and antibody are two types of molecules that relate to B cells. The B cells are one of the two types of lymphocytes that the the bone marrow produce. B cell receptor (BCR) is a type of receptor molecule that we can find on the surface of the B cells. T helper cells induce B cells to proliferate and produce specific antibodies against a particular pathogen. Furthermore, a clone of B cells produces only one type of antibodies. A typical B cell may contain around 105 of such antibodies. Moreover, the initial antibodies produced by the B cells are not secreted to the circulation but are inserted into the cell membrane to serve as BCRs. The antibodies that are not secreted into the circulation are called immunoglobulins. Hence, BCRs are such immunoglobulins on the surface of the B cells. The binding of a specific antigen causes the activation of the B cell receptor. This initiates a cascade of intracellular signalling, which leads to the internalization of the antigen-bound BCR for the processing and presenting the antigen to the T cells. An antibody is a protein molecule that the B cells produce in response to a particular pathogen. A particular antibody clone is specific to that particular pathogen. 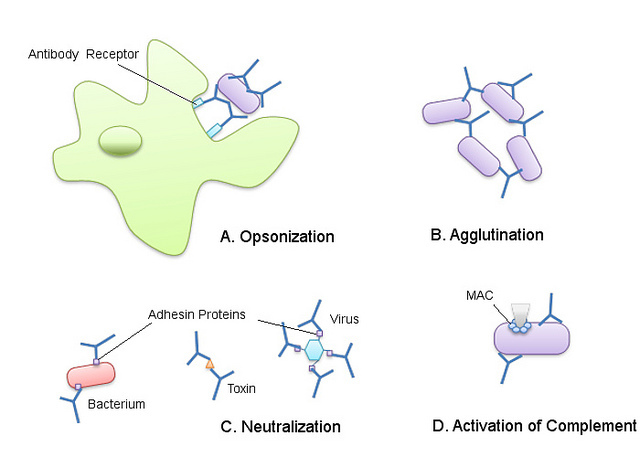 Also, the T helper cells present the antigens of the pathogen for B cells for activation. Then, the antibody-secreting effector B cells secrete a largeamount of soluble antibodies into the circulation, which can then bind to the pathogen to neutralize it. The antibody-secreting B cells are called the plasma B cells and a matured plasma B cell can produce around 2000 antibodies per second. An antibody is made up of four polypeptide chains: two heavy (H) chains and two light (L) chains held together by both covalent and non-covalent bonds. 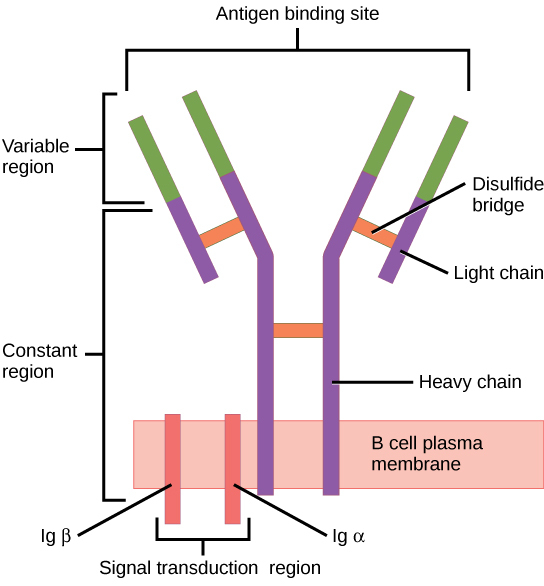 According to the variability of the heavy chain, there are five classes of antibodies: IgA, IgD, IgE, IgG, and IgM with respective heavy chains α, δ, ε, γ, and μ. 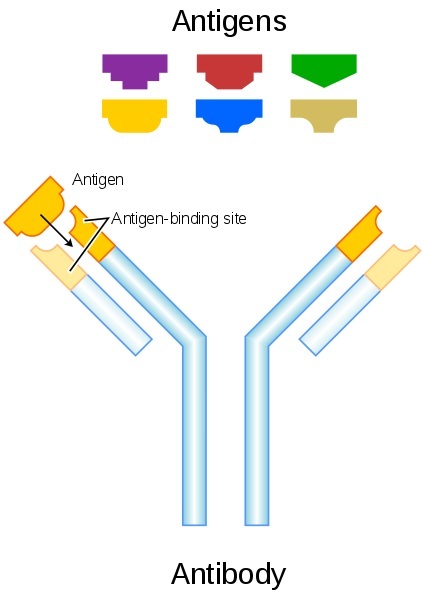 The antibody molecule has a Y-shape with an antigen binding site at the tip of each arm. Two of them are identical. Thus, antibodies are bivalent. When a particular antigen has several antigenic determinants, antibodies form a lattice by cross-linking. This lattice is more prone to phagocytize by macrophages. Which means, the antibodies can recruit other types of cells in the immune system to destroy the pathogen. On the other hand, they can elicit immune responses through the activation of the complement system by recruiting the first component of the complement cascade. B cell receptor and antibody are two types of functional molecules that relate to B cells. Both are immunoglobulin molecules. Therefore, they contain two heavy (H) polypeptide chains and two light (L) chains. Also, B cells produce both in response to a particular antigen; hence, all B cell receptors and antibodies that a particular type of B cell clone produce contain the same antigen binding site. They are responsible for the generation of humoral immune response. B cell receptor refers to an immunoglobulin molecule which serves as a type of transmembrane protein on the surface of B cells while an antibody refers to a blood protein that the B cells produce in response to and counteracting a specific antigen. 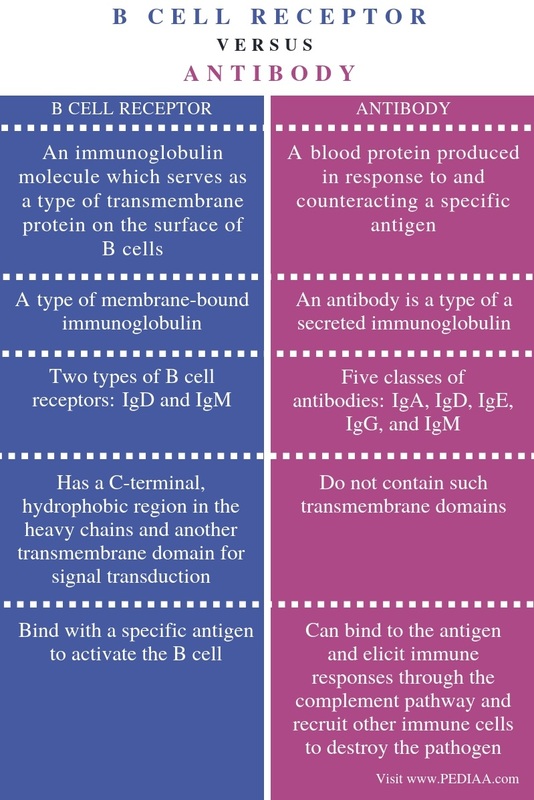 Thus, this is the main difference between B cell receptor and antibody. While a B cell receptor is a type of membrane-bound immunoglobulin, an antibody is a type of a secreted immunoglobulin. The only structural difference between B cell receptor and antibody is the presence of C-terminal, hydrophobic region in the heavy chains to serve as transmembrane domains and the presence of another transmembrane domain for the signal transduction in the B cell receptors. Antibodies do not contain such transmembrane domains. The two types of B cell receptors expressed by a mature B cell are IgD and IgM while the five classes of antibodies are IgA, IgD, IgE, IgG, and IgM. Another difference between B cell receptor and antibody is that the B cell receptors bind with a specific antigen to activate the B cell while antibodies can bind to the antigen and elicit immune responses through the complement pathway and recruit other immune cells to destroy the pathogen. B cell receptor is the type of immunoglobulin that a particular clone of B cells produce in response to a particular pathogen. These immunoglobulins are not secreted into the circulation but, they are inserted into the cell membrane. They bind to their specific antigen and the antigen-bound B cell receptors are processed and presented again to the T cells. On the other hand, antibodies are the immunoglobulins that secrete into the circulation. Their main function is to neutralize the antigens in order to destroy them by recruiting other immune cells or elicit an immune response through the complement system. In conclusion, the main difference between B cell receptor and antibody is their significance and role in the immune system.